Ballyspallen’s exploits in the Bank of Ireland senior cup pretty much dominated events on the Championship front this weekend as Lee Ritchie and his team celebrated a thoroughly deserved semi-final win at home to Fox Lodge. It was a superb occasion for the hard-working Roe Valley club played out in glorious sunshine with their “reward” being a final weekend against the kings of North West cup cricket, Donemana. Just to quantify ‘Spallen’s success it has been 34 years since a second-tier side (Ardmore) last made the showpiece decider and you have to go back five years earlier than that (1978) to find the last Division 2 winners of the competition, St Johnston. It was the most comprehensive of victories on Saturday with the home team making 218 and then dismissing Brian Allen’s side for just 77 with the only drawback being the disappointment for Graham Kennedy who will miss the final due to Ireland under-19 World Cup duty. Elsewhere in the division it was the start of the Sam Jeffrey Shield and the biggest surprise of the day came at Strabane Park where Bonds Glen progressed to the semi-final at the expense of Barry Scott’s team. Jacob Mulder (36) top scored for the visitors as they rallied to make 180 all out after three wickets from Ryan Gallagher and a couple from Mark Snodgrass had them struggling early on. 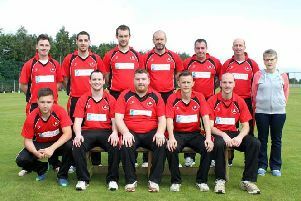 The home side though never really got going in reply and although Kevin Pretorius made 37 and Aaron Gillespie 21, four wickets apiece for Derek Curry, Richard Hepburn, Kyle Magee and Graham Boyd kept Strabane at arm’s length. The final margin was 53 runs as the Bee Gees put their league difficulties behind them with a decent win. There were two centuries for Newbuildings as they inflicted another heavy defeat on Killyclooney- Peat Salmon with 138 not out (11 fours and 9 sixes) and Tommy Thompson 103 (13 fours, 3 sixes) as the hosts racked up 302-3 from their 50 overs. ‘Clooney were never at the races after that- Andy Lynch with 34 the best of their reply while there were five wickets for Chris Cooper as Newbuildings won as they liked. In the final match St Johnston had six wickets to spare over a Burndennett side that has struggled of late. Mark Doherty’s 26 was best of ‘Dennett’s 111 all out with David Lapsley picking up four wickets and Josh Cole three for the visitors. David Macbeth’s 25 and 22 from Ian were enough for the Donegal men to progress with a cosy 6-wicket win. Ballyspallen’s tie at Glendermott was scheduled to be played on Sunday but fell victim to the weather and will now be played at a later date.